Saturday 22nd July 2017, Tramlines Festival @ The Hubs, Sheffield (with Jane Weaver and Cian Nugent), on stage at 7.30pm. Free entry. Friday 28th July 2017, Cloudspotting Festival, Gisburn Forest, Lancashire (with This Is The Kit, The Wave Pictures and more). So here it is. We've been quietly beavering away on our new album for a couple of years now. After the last album ('Folk Songs II'), I wanted to make a change, and concentrate on creating our own music, rather than re-interpreting traditional songs. I discussed with Heather, who has slowly become our lead singer about working on songs together, myself writing the music, and her the words, and so the process of making 'Oh!' started. I looked at finding new players for the band, which I wanted to work like a live group, rather then some of the sprawling line-ups we'd had in the past, with 20 or so contributors on a typical album. I wanted us to sound like a 'unit', and work on these new songs together until they felt ready and then record them for the album. Previously Big Eyes had mostly recorded pieces first, and when it came to live work we tried to adapt them. Bit by bit, Heather and I pieced these new songs together and we found solid cohorts in Sharron Kraus (well known as an established folk singer/solo artist) who joined as bass guitar and singing, Guy Whittaker on drums (who I'd known before from the other band he plays in, the wonderful Magpies) and James Street, who was recommended to me as a bit of an organ-whizz. He certainly is. Heather's lyrical subjects range from adoption gone wrong (Pendulum) to the London riots of 2011 (Reeves' Lament); from the surreal tale of Ann Boleyn stranded in a futuristic African wilderness (Desert Queen) to the tragic tale of Joyce Vincent (Joyce), who was found dead in her flat in London three years after she died, her TV set still on, partly-wrapped Christmas presents at her feet. There is one cover on the album, 'Song For Thirza', a little-known song by Lal Waterson; a true-story about a girl who lived with the Waterson family, rescued from the workhouse back in the 1950s. We had now worked the songs into workable forms and started recordings with James Barlow at Red Cloud Studios. Now I was curious to work with a producer, since pretty much everything we had done before was self-produced. I had Dean Honer in my sights. He is something of a Sheffield legend, part of I Monster, Eccentronic Research Council and Moonlandingz, and someone who could potentially twist our new songs about and heighten the atmospheres in his studio, 'The Bowling Green'. Luckily he agreed, and we are more than chuffed with what he has done. He also played synth on a few tracks, and viola/bowed-saw player Aby Vulliamy (Bill Wells/Trembling Bells/Dark Northumbria) added some further magic. The sleeve of the album was designed by textile artist/designer Laura Slater. I've admired her bold print work for years now, and figured it might work well on a record sleeve. Sorry if it sounds like blowing my/our own trumpets, but I think this is best record Big Eyes has ever made. I feel a bit like I did when we released our first record ('Big Eyes Songs', back in 2000), except then I felt that we were creating our own 'classical music', and this time, we have created our own 'pop music' (albeit pretty strange pop music). I really hope you enjoy the album as much as we have enjoyed making it, and I want to thank all those who helped us make 'Oh! ', the Players, Mr Barlow, Mr Honer, Jen Halse and all at Home Assembly Music. 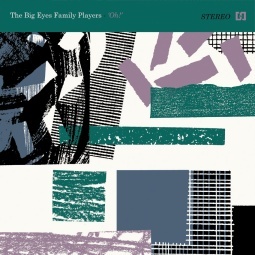 The Big Eyes Family Players - OH! I’m not quite sure if Home Assembly Music is attempting to throw me a curveball with this album, but following recent releases from the likes of The Declining Winter, Peptalk and A New Line (Related), it would be fair to say that there’s no musical commonality between the various artists on the label. Be it techno, post-rock, folk, or even modern classical, I wouldn’t put it past Home Assembly to release an album of Barron Knights “classics” in an electronic style performed by a Steps tribute act. Possibly. ‘Oh!’ is actually The Big Eyes Family Players’ seventh album. First things first, I love the sleeve. There’s a definite ‘retro’ feel to the artwork which actually suits the music rather well. This includes the neat little inclusion of the ‘STEREO’ banner in the top-right-hand corner, just like albums from the sixties. In fact, the entire album really doesn’t feel like it’s from 2016 at all. The sixties would feel far more appropriate. Not the ‘swinging’ sixties either – there’s no Cilla Black or Twiggy on offer here. During the first few bars of “Pendulum”, I actually wondered if it might open out like, say, “Billy Blue” from Faith Over Reason, but then it goes completely off at a tangent. For some reason, it makes me imagine a woman in a long, flowing white dress dancing on the top of a hill while singing about fairy dust, goblins and magic. It’s actually a nice track – in a completely bonkers kind of way. “Reeves’ Lament” is far more your traditional kind of folk – though the inclusion of the olde-worlde organ adds a third dimension. In fact, the intro and the time signature kind of initially pointed me in the direction of Country and Western. For a moment there, I was sweating… The track itself is quite understated, which says a lot about how the band interacts. Often musicians want to leave their mark, which results in ‘volume-overload’ as the guitar part becomes more pronounced, causing the keyboards to be turned up a notch and then the drums followed by even more guitar etc. Before you know it, a band who on record sounds like All About Eve suddenly sounds like Iron Maiden on stage – with everybody competing for volume and space in the mix. What’s really nice here is that the band knows how to make the songs work without having to play the loudness game. There are odd moments when the songs do pick up volume – generally when introducing an organ or strings for a chorus or middle-eight – but there’s a feeling of lots of ‘space’ in the mix, which I like. Heather Ditch’s vocals flow effortlessly atop the instrumentation and work really well. In fact, her vocals suit the music perfectly. Guy Whitaker’s drums also deserve a mention as they really impressed me; during ‘Ghosts’, it’s the drums which really drive the track forwards with a feel which I’m sure Elbow would be delighted with. “Witch-Prickers Dream” is an odd title for a track, don’t you think? It turns out that during the 16th century, common belief held that a witch could be discovered through the process of pricking their skin with needles. Well, witch-prickers may indeed dream – but I would proffer that they’re probably not having a dream at all – it’s actually a nightmare. At the end of the day, if a potential witch turns out not to be a witch then what sort of life can they look forward to? They’re probably going to be burnt regardless “just to be on the safe side”. The track doesn’t sway me from this thinking given that it sounds like it might have been recorded in the 16th century. Anyway, I’m off to look for some needles just in case. “Ray” is my favourite song here. There’s a dark edge to the track, helped again by an organ which sounds like it might have been lifted straight out of the Hammer House of Horrors – and the chorus is fabulous too. This is music which could have been recorded at any time. 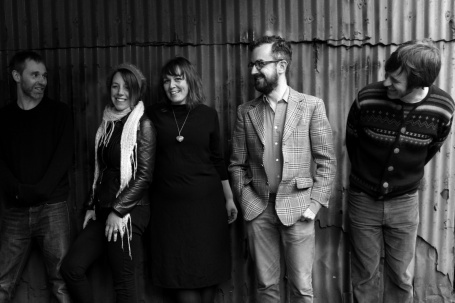 The band have worked really well to create something ‘otherworldly’ and different.